« What Happens When Technology Becomes Just Another Appliance? I recently read an article by Dennis Pierce in eSchool News that discussed Alan November’s “First Five Days” project. November announced this project at his Building Learning Communities conference in Boston in July 2012 with the goal being to make the most out of the beginning of the school year in order to set the stage for nurturing further success. From my conversations with teachers around the country, many educators are returning to schools with new policies aimed at encouraging students to Bring Your Own Technology (BYOT) to facilitate learning experiences. In thinking about the first five days in a BYOT classroom, what kinds of things should happen to successfully begin this transformational implementation? I brainstormed my own list and tried to organize it chronologically according to each of the five days. However, I again realized that in the BYOT classroom, many things have to happen just in time (or simultaneously), and a sequential list of orderly items was impossible (for me). As Anne Collier explained in her blog at NetFamilyNews.Org, all kinds of learning [happens] all at once with BYOT. Instead, I’ve enumerated a simple list of five strategies for the first five days of BYOT and provided links to additional resources whenever possible. Construct a learning community. You will need an online space to house your learning community. Wenger, White, and Smith referred to this online space as a digital habitat, and the teacher becomes the steward or facilitator of that habitat. That space could be a blog, website, wiki, LMS, etc, and this is the environment where you and your students can learn more about each other, participate in on-going discussions, and practice digital age skills. As you decide what type of space you should use, think about the needs of your students. This may include the accessibility they have to various types of technologies; their ages, interests and capabilities; and your goals for interaction. For more information, review these strategies for designing an online learning community. Discuss responsible use. Empower your students to talk about the appropriate ways to use their technology tools at home and school. Students need time to share their devices with each other and to demonstrate how they use them. They can also provide scenarios regarding technology use that illustrate the importance of using them responsibly. When is the right time to utilize technology tools, and when should they be put down in order to be “present in the moment” as suggested by Jen LaMaster in her blog of Ed Tech Reflections? Encourage your students to develop these group norms for behavior in your learning community along with your input, and provide them with multiple opportunities to practice and reflect on responsible use during the first five days of school. Model your expectations. It isn’t sufficient to just say that you have high expectations for every student. 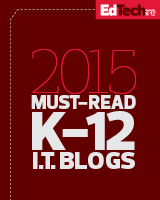 Show the students that you trust them to do the right things with their technology devices. For example, every student can participate in a class wiki to develop guidelines for responsible use so that everyone contributes to the body of knowledge of the learning community. Students are actually smarter in the appropriate use of technology, than most people think (see here). A free class wiki can be organized in Wikispaces to ensure the input of all students. Practice the 4 C’s of Digital Age Learning – Communication, Collaboration, Creativity, and Critical Thinking. Begin a week long project that supports inquiry and the use of the students’ technology devices. If some students do not bring technology devices, encourage collaboration through sharing and maximize the use of the school’s technology resources. Projects need to engage students in higher level thinking and authentic work. Bernajean Porter explained different uses of technology: Literacy, Adapting, and Transforming in her Grappling’s Technology and Learning Spectrum, and in the first five days, the students will have to participate in some literacy and adapting activities. However, the ultimate goal should be to achieve transforming uses of technology in that students become producers, rather than solely consumers in their learning, and the implementation of BYOT can lead to greater student agency and empowerment within the learning community. Be patient. Understand that students will occasionally make mistakes with their technology devices, but these mistakes are essential during this learning process. Use these situations to reinforce the appropriate ways to use technology at school as well as to learn new technical skills. Although they may know how to use these for entertainment and communication, they don’t always know how to learn with them as members of a community. If you don’t know how to resolve a situation, be willing to learn alongside and from your student experts. Consistently challenge students to do their best work and look forward to an outstanding school year! Can you think of some additional strategies for BYOT in the first five days of school? 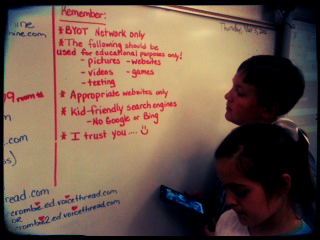 This entry was posted on July 25, 2012, 3:53 pm and is filed under BYOT Strategies, BYOT Vision. You can follow any responses to this entry through RSS 2.0. You can leave a response, or trackback from your own site. What if we tied BYOT to a getting to know you project during the first week? The students could work in pairs to introduce a classmate to the class. They could even decide how they could do this and share some of the ways that they use their devices with everyone. I think that is an awesome idea for the first week of school because it is an authentic use of their technology tools and builds community, Scott! I love Scott’s idea and have this suggestion for constructing the activity. What if students had to include in the introduction one thing their interviewee wanted to learn this year and one area of expertise he or she feels could be contributed to the class? Great idea for a getting to know you and then creating/sharing a biography about a classmate. I suggest using your online “HOME” for the students to create questions that the students must answer… each person needs to add another component/question that hasn’t been asked yet. Enjoy! I love BYOT…just difficult sometimes to get the infrastructure set up! However, luckily my students have 4G access when most of the faculty doesn’t!!! Been talking with a coworker about getting students to start a blog, and over the year update it with their longterm project updates. As a first week activity they could make a bio blog and each would be required to share and comment on each others blogs. I think the best thing to do is discuss and practice responsible use. Teachers and students…adults and children…everyone has to be on the same page in order to have an effective technological coexistance. This includes getting your administration on board. The benefits have to outweigh the risks if a district or school is to consider a change in policy. Perhaps starting small? Baby steps…maybe using mobile devises to take a survey…and then move on to perhaps bigger and better things. And on a different note…..does anyone else think that perhaps the problem is with the teachers? Maybe the more traditional ones are just afraid of technology? Perhaps they are still in the mode of mimmiograph (sp?) and ditto sheets? Just a thought. Mimeograph. LOL. I haven’t thought about one of those for years! !